Welcome to QwikCoach from Coach People! 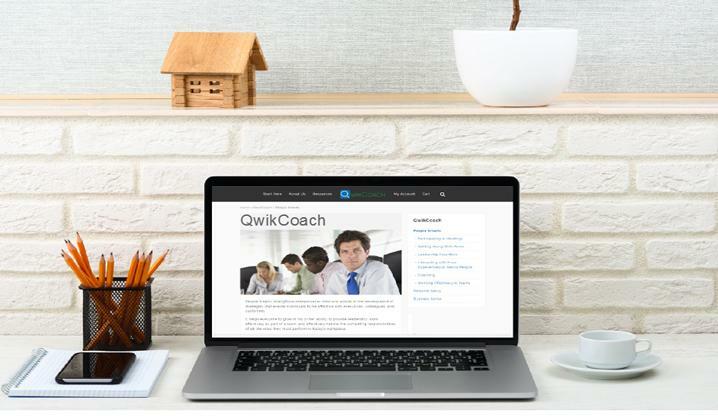 QwikCoach is the workplace performance improvement tool designed to act like a “live” coach — your own personal one — by providing coaching advice and support for strengthening know-how and performance. QwikCoach provides simple direct access to world-class electronic coaching support and expert workplace performance coaches. It provides all the help individuals and organizations need to build key workplace capabilities, overcome challenging situations, and excel in today’s modern work environment. With coaching support for 14 areas of competence and 100 specific workplace competencies, QwikCoach provides thousands of coaching tips, techniques, practices ideas, and an array of curated resources to give you all the support needed to excel, advance, and achieve success. QwikCoach is currently used by people at companies including American Express, Atlantic Metro, Bank United, Best Western, Gold Coast Schools, One Blood, Origene, Sinclair Broadcasting, Team Logic IT, and more. Click Buy Now and follow the simple directions. Click here to learn more about QwikCoach for individuals then return to this page and click the Buy Now to purchase. QwikCoach is available for $249/year for Coach People users. To receive special Coach People pricing enter the code coachpeople at checkout. Complete the form below to schedule a meeting to discuss your needs and learn about special volume discount pricing for Coach People clients. Click here to learn more about QwikCoach for the enterprise then return to this page to complete the form below. We’ll contact you within 24 hours of receiving your form to schedule a meeting.